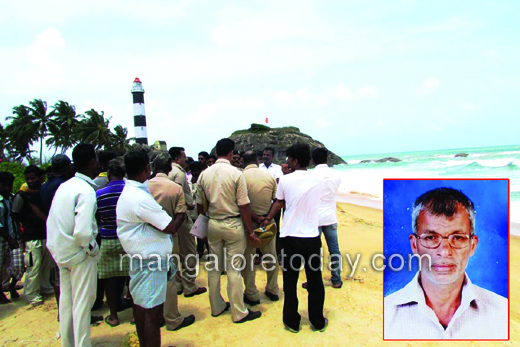 Kaup, Udupi: July 6, 2015: The body of an elderly person Ramesh Karkera, who had drowned in Kaup beach while fishing, was recovered with the help of expert divers. The police had launched an operation to retrieve the body of the deceased. And with the help of expert divers Shivaji Kotiyan Kaup, Harish Karkera, Sadanand and Soori shetty the body was retrieved. Ramesh Karkera resident of Kaup, drowned to death after he slipped into water while fishing at Kaup beach on July 4, Saturday. Fishing is very risky. They have to be very careful while going on fishing in rainy season as the sea is also rough. We are very sorry for Ramesh’s family .